As you might know, today is a special day set aside in many countries in the world to celebrate the achievements of persons with visual impairment and to promote white cane as an important symbol of independence for the blind. Over the years, the white cane has become a very popular tool of mobility as well as a symbol of independence for the blind across the globe because it is this particular device that has brought the visually impaired persons out into the streets and highways, and helped them live a fully independent life in the community. Prior to the invention of this type of cane, the life of visually impaired persons was mostly confined within the four walls of their house. But today with the help of this mobility device, we the visually impaired people have been able to come out into the public and participate in the mainstream society without much difficulty. Although the use of white canes existed in other parts of the world since as early as 1920s, it has been gaining popularity in Bhutan only over the recent years. Even when I was in school in Khaling, the use of white cane was not common among us and there was no encouragement from the school authorities either until the later years of my student life. Only after I reached high school, the school authorities started to promote the use of white cane and trained us on how to use it systematically and efficiently. Although we were entitled to a braille-kit when we reached Grade 6 that contained a white cane among a number of other learning tools, nobody advised us to use it at that time. Moreover, the whole environment was so familiar to us that none of us needed any mobility aid to navigate around within the school campus or even within Khaling town area. We were so confident to walk independently that we never took interest in using the white cane. Moreover, we had a very different notion about using white cane during those days and instead of respecting it as a tool for independence, we felt shy to use it in front of the sighted friends for preconceived fear of being silently made fun of. To be honest, I was not comfortable with the kind of attention it would draw towards me from the public. I didn’t realize its importance and significance until I got a week-long training in 2011 through the Special Education Division of the Ministry of Education. The training really convinced us the importance of using a white cane and how it can serve as an identifier for motorists while crossing the roads, and that made me decide to start using the cane seriously. Today, it has become my regular walking aid and I feel very uncomfortable without it. It has been a very useful tool for me to find my ways, be it in a familiar or a new environment, and the best part is, I no longer hesitate to carry it wherever I go. It has indeed become my best friend now. It is believed that the first white cane came into existence in 1921 when James Biggs of Bristol in Britain painted his cane white to increase his visibility to the oncoming motorists so that they could exercise special care for him while crossing the roads. Since then, the visually impaired persons started painting their canes white to enable the motorists see them easily and clearly. In America, the credit for the introduction of white cane is attributed to the Lion’s Clubs International. When one of its members saw a blind man attempting to cross a road with his black cane in 1930, he realized that a white cane would make him more visible to the motorists and hence, the idea of introducing white canes for the blind was born. As years passed by, the use of white cane began to gain momentum in all parts of the world and it began to make its way to government policies and laws in many countries. In 1964 following the campaign by the National Federation of the Blind, the President of the United States, Lyndon Johnson declared 15th October to be observed every year as White Cane Safety Day to recognize the abilities of persons with visual impairment to lead a fully independent life in the society as well as to raise awareness on the significance of their tool for independence and self-reliance, the white cane. There are mainly two different types of white cane today. One is long but it cannot be folded. It’s stronger than the one which can be folded at least four or five times. But the foldable one is more convenient for me since I can carry it easily wherever I go. Although it does not contain any digital sensor like some computerized canes developed in other advanced countries, the white cane we use in Bhutan is good enough to alert us to the obstacles on our paths and to help others identify us as visually impaired persons. There is a streamlined set of rules and procedures designed for us through experiences and research studies on how to use the cane in a systematic manner so that we don’t miss any dangerous point on the way. More than a mobility device, it’s indeed a symbol of our independence and the identity of our disability. 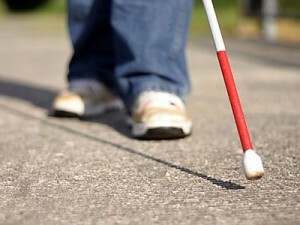 So whenever you see someone walking with a white stick in his hand, you must know that he/she is visually impaired. One of the biggest challenges in Bhutan today is that many people are still not aware of the significance of the white stick carried by visually impaired persons. I have been regularly using white cane over five years now and there have been at least two incidents when I was nearly hit by speeding cars despite being seen crossing the highway with a white cane in my hand. In both the cases, the drivers didn’t even bother to stop and apologize. So, I think there is a need for greater awareness on the significance of this mobility device in Bhutan. In other countries, it gives blind the right of way and that the motorists should immediately stop when they see a person with white cane and let him or her cross the road. But in Bhutan, this trend is very low at the moment. I have so far personally met only a few individuals who have stopped their cars to let me cross the roads whenever they saw me with the cane. However, with the passage of time, I hope more Bhutanese people would gain exposure and begin to respect the significance of our cane. This is what defines us as a visually challenged person and it is lot more than what you see it just as a white-colored stick. On this special occasion of White Cane Safety Day 2015, I would like to wish all the visually impaired citizens of this country a very meaningful and fruitful life ahead. With the help of white cane, let us all grow together to our full independence with greater visibility in the society. To the rest, the only support we expect from you all is to help us get this message across the communities so that we can be better understood by the public. Together, we can definitely make a difference. As always, this post is very wonderful one. I just get to know lots about the mobility device and you. Actually, it is just a stick for us but having read this post, I know that it means a lot for you all. Happy White Cane Safety Day and enjoy your independence!